If you’re a bowman you need arrows, that’s a pretty indisputable fact. What you need them FOR, now that’s the question. Different arrows are designed for different tasks. A hunter needs a durable arrow with a lot of kinetic energy for penetration. A target shooter? Well the question then becomes what type of target shooting, what distance and where? Note: Our individual reviews are below, but you can also click any of the links above to check current prices. Skinny or slim arrows expose less surface area to the elements. This makes them more resistant to the effects of crosswind and also rain. When you’re shooting outdoors the elements are a factor and, even though you’ll still have to correct for wind. The flight path of a skinny arrow will be less affected by it. The arrow fletchings are also critical to the aerodynamic effect of the elements. Again a low-profile vane will be less affected by them than a larger feathered vane. A larger or longer vane will cause more drag through the air, slow the arrow but give more steering control. This control will allow it to correct more quickly from the fishtailing effect straight out of the bow. This is useful when shooting short distances. Low profile and shorter vanes will be faster through the air and less affected by wind. Better for long distances. 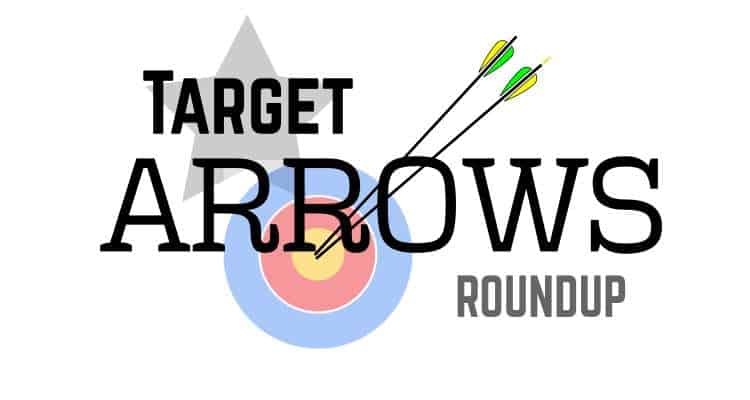 Helical or offset vanes will be a compromise, they will add a little more air resistance to the arrow than straight vanes, but they will also create more spin in the arrow. Spin also helps to stabilize the arrow faster when coming out of the bow. Fat shafters or thick arrows are designed for breaking scoring lines. If you shoot a fat arrow the tip is fatter and the hole you make in the target is larger. You are more likely to cut across the line of a higher scoring ring if you make a bigger hole. You’ll often find a competitive indoor target shooter with fatter arrows. World Archery allows up to 9.3mm or 23/64” diameter arrows, whilst some other organisations allow even fatter. It is sometimes difficult to separate good aluminium from good carbon where indoor target arrows are concerned. One of the main deciding factors is usually how hard the targets you are shooting will be. If you shoot aluminium into a hard target, it may be likely to develop a bend, whereas carbon will keep it’s shape. The Easton genesis are made from 7075 aerospace grade aluminium alloy. Aerospace grade alloy is designed to be strong. These are also anodized to stop corrosion. The Genesis are the only arrow approved by the NASP® (National Archery in the Schools Program) for tournament competition. These are great practice and target arrows for a beginner or someone with a 45 lbs or less draw weight bow (recurve or compound). You may find with repeated use and abuse that they will develop bends because of the aluminium construction. The Easton XX75 Jazz is an aluminium arrow fitted with a true flight feather fletching. These feathers have a helical offset to give additional spin to the arrow flight and assist when shooting both indoors at short distance and outdoors in wind. This makes for a universally competent arrow. They are specified for draw weights of up to 50lb. Fitted with either bullet or field points which can be easily replaced or changed as they are screw in. XX75’s are made from 7075 aerospace alloy with an anodized finish. M.A.K are a budget arrow manufacturer from China. That shouldn’t put you off because lots of arrows begin their life in a Chinese manufacturing plant. M.A.K just bring them to you more directly without the usual intermediary to bump up the price. These carbon arrows are designed for both hunting and target practice and have replaceable nocks and tips. They come fitted with field points. Overall a good set of affordable practice or hunting arrows. Pre constructed cheap fiberglass practice arrows from Antsir. These come with screw in field points for target practice that can be replaced if you want to. They are completely assembled with fletched and nocks that will adjust to your bow. These are specified for use with bows upto 80lbs in draw, but you do that at your own risk. Maybe with an 80lbs bow and a short draw you’ll be fine. These are an affordable practice and beginner arrow, good for that but not for serious shooters. Gold tip state that the X-Cutter is the most popular shaft in 3D archery. It has a large diameter and light construction which is everything you need to get an advantage. A durable carbon arrow shaft that can be coupled with the components you like @ 24/64” diameter. Easton are a well known manufacturer, probably one of the most well known. The Fat boy arrow is exactly that, a fat durable carbon arrow. Designed for easy removal from target butts and to cut scoring lines to increase your chances of success. The 9.3mm diameter of these is the world archery maximum. These arrows are specifically designed for competition recurve target archers. They have an ultra-slim diameter and are ideal for long distance and field shooting. Made from carbon these won’t bend with repeated impacts like an aluminium equivalent. They come in 3 color choices, each with a zebra print design on the shaft. You can get them ‘fletched’ with 2” raptor vanes or shaft only. They need to be cut to size and inserts added. These have GT Nocks, which are Gold Tips push-in nocks and each weighs about 11.5 grains and also come with Accu-Lite inserts at 12.1 grains each. Specifically designed as outdoor arrows. All things outdoor in fact. 3D, field or target this arrow should be right at home. They come in a wide range of spines and constructed from 100% carbon makes them durable and excellent for retaining tension. This is a light arrow designed for speed and accuracy over distance and minimum wind deflection. Need to be cut and finished. Shaft only.